Even before trees crashed through roofs and smashed fences on his street for three straight weeks in a row, Kalki Winters knew some of the trees on his street were shady - and not in a good way. Winters is a the V.P. of Operations for Greenline Landcape. He says that the Cooper-Young area is particularly vulnerable to falling trees, because there are so many Red Oaks in the neighborhood. "We have a lot of Red Oaks," says Winters. "They are shallow rooted. These trees were planted 100 years ago because they are fast growing. But when you combine their shallow roots with the clay soil we have in the area, it's a problem." But it's not just Red Oaks causing problems. Winters notes that Memphis has experienced drought conditions the past couple years. Then when heavy rains hit it loosens the ground around the tree base, instead of seeping slowly and deeply into the soil. Winters says homeowners also compound the situation by not watering trees properly. He says trees should be soaked - not sprinkled frequently for a few minutes. 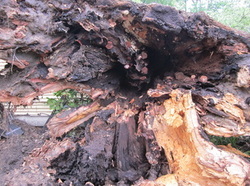 Failing to soak trees also contributes to shallow roots. Winters also recommends that people get their trees trimmed regularly. Trees with large, thick canopies provide too much resistance to high winds. The result is the wind pulling and shaking the trees more vigorously than a tree with a thinner canopy. Additionally, Winters says that trimmed trees are just healthier," Good airflow and more sunlight decrease growth of fungus and disease in trees. Like anything, trees that receive more air and light are cleaner." If you have a large tree on your property, remember it is the landowner's responsibility to care for the tree. Winters says when you buy a home with a beautiful large tree you must ask yourself, "can I afford to care for it?" So, how can you tell if your tree is in trouble? Winter says sometimes it's obvious. If you see visible rot or holes in the bark, or if the top section of your tree died before the end of the season - those are signs that your tree is in stress. Sometimes, though, it's not so easy to tell. But Winter's claims that unless you are positive your tree is healthy and properly trimmed, it's a good idea to call in a specialist. And he's not just saying that because he's in the landscape business.